David has been in the industry for 40 years and is a licensed Real Estate / Stock and Station Agent and Business Agent. A third generation local , his outstanding reputation and expertise in Southern Highlands Real Estate is a credit to his professional and personable manner. 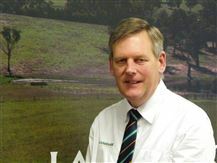 Community and family minded David has previously served as a Wingecarribee Shire Councillor, President of Moss Vale Rotary and President of Burradoo Polocrosse club.